For other uses, see Richard. Richard John Kind (born November 22, 1956) is an American actor known for his roles in the sitcoms Mad About You (as Dr. Mark Devanow) and Spin City (as Paul Thomas Lassiter). Kind was born to a Jewish family, in Trenton, New Jersey, the son of Alice, a homemaker, and Samuel Kind, a jeweler who formerly owned La Vake's Jewelry in Princeton, NJ. Together with his younger sister, Joanne, he grew up in Bucks County, Pennsylvania. Richard attended Pennsbury High School with fellow thespian, Robert Curtis-Brown. Kind is a 1974 graduate of Pennsbury High School and a 1978 graduate of Northwestern University where he was in the fraternity Sigma Alpha Epsilon. He is also an alumnus of The Second City Chicago and lives in Santa Monica. Kind is the third actor to play in both the movie and in a Stargate series; The two first were Alexis Cruz and Erick Avari who reprised their roles of Skaara and Kasuf in Stargate SG-1 respectively. The fourth one was French Stewart who portrayed Dr. Andrew Covel in the Stargate Universe episode "Alliances". Kind is the only original movie actor to play in Stargate Atlantis. ↑ "Richard Kind Biography (1956-)". FilmReference.com. NetIndustries. 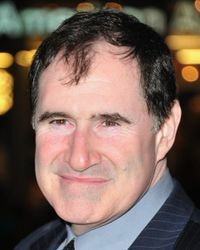 http://www.filmreference.com/film/53/Richard-Kind.html. Retrieved 2009-08-13. This page uses content from Wikipedia. The original article was at Richard Kind . The list of authors can be seen in the page history. As with Semantic Stargate Wiki, the text of Wikipedia is available under the Creative Commons Attribution-ShareAlike 3.0 Unported (CC BY-SA 3.0). This page was last edited on 6 December 2014, at 22:05.